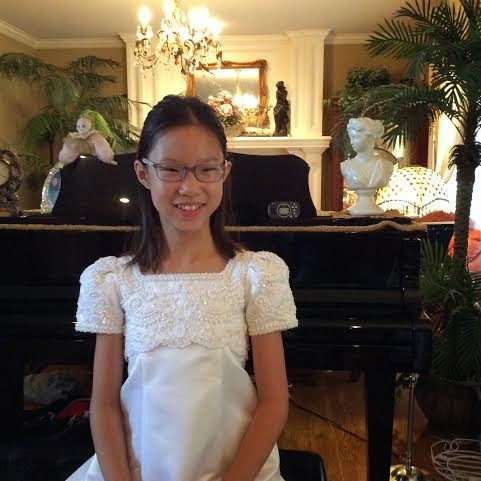 Melody Jiang, 10, attends Sunnyside Elementary School in Olathe, KS, is currently studying piano under Ying-Yu Emily Yeh’s instruction. Melody has participated in many auditions and competitions and received numerous awards. Melody was name the second place winner in Kansas State Honors Competition in 2013 and Honorable Mention in 2011 and 2012. In 2011 and 2012, Melody performed in the Fall Festival held by Kansas City Music Teachers Association and received Highest Honors rating. She was also a Piano Guild Audition National Winner is 2014. In January 2014, Melody was invited to perform for Kansas Winners Recital, hosted by Kansas City Chinese-American Association. Melody is also a violinist. Besides music, Melody loves to dance, swim, run, draw and write.